Checking for errors in language can be rather tedious especially if you had not been paying attention in your grammar class. But an error-ridden piece of writing can be a source of embarrassment as well as cause you to lose that multi-million deal. Failure to check your grammar can translate into the loss of confidence in your ability and in your work. For students, it can mean the difference between an A or a B, or even a pass or fail grade. The ESL Assistant can be of tremendous help to minimize your mistakes in language either due to carelessness or ignorance. 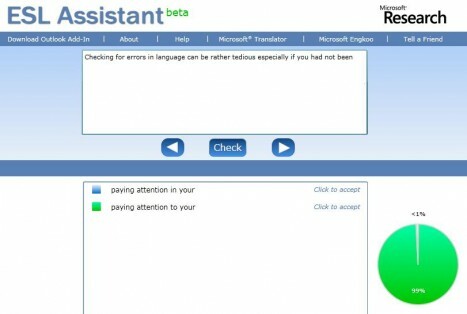 Developed by the Natural Language Processing Group at Microsoft Research in Redmond, ESL (English as Second Language) Assistant is a free web based prototype proofing tool that can help non-native speakers to identify possible flaws or errors in their English writing and suggest improvements or rectifications accordingly. To make use of this free service by Microsoft, users can go to the ESL Assistant site and type or paste their English sentences into the text box. The “English Teacher” will then check for possible errors in their writing and indicate them with wavy green underlines (squiggles). If users point the mouse at a section of text with a wavy green underline, the ESL Assistant will display some suggestions. If users move their mouse to highlight a suggestion, the ESL Assistant will now search the World Wide Web to find real examples, so that users can compare the suggestion with what they wrote and decide whether the suggestion matches what they are trying to say. ESL Assistant will check for potential errors such as spelling mistakes, preposition confusion, confusable adjectives, word order, noun number, verb morphology, auxiliary choice, gerunds and infinitives. 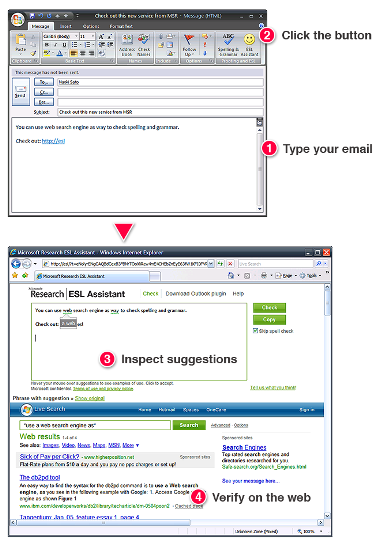 The ESL Assistant from Microsoft Research also offers Microsoft Outlook users an Outlook add-on to be installed in their Outlook (Version 2007 onward). This outlook plug-in will allow users to send the contents of the email message they are writing directly to ESL Assistant. The text will then be immediately checked for errors. Users who want to add this plug-in to their Outlook program can download it via the link here. The ESL Assistant is currently in Beta and still in testing stage. Undoubtedly there are still false corrections and errors spotted in the program itself here and there, but overall the correction results and suggestions are still quite satisfactory. The English non-native speakers can make use of this free service to minimize their English grammar mistakes.